Debashish Dasgupta is an Indian national, born in West Bengal, India. He holds an MBA from Symbiosis International University, Pune, India and a Bachelor of Commerce from University of Pune. With Amicorp since March 2010, his responsibilities include business development for Amicorp global products & key relationship management. While at Amicorp Mumbai office, Debashish was also responsible for developing the Middle East market for Amicorp and later set up the UAE operations for the group in September 2011. 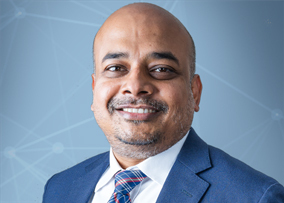 Before coming to Amicorp, Debashish was Associate vice president at Finovant Partners, a global investment banking & advisory services group with headquarters in the United States. Debashish was engaged to start their India business and business development. Prior to moving to Finovant, Debashish was an Associate at SVB Financial Group’s India Venture Capital Advisory business and at Swansoft Web Technologies (Axis Business Solutions). At SVB, he worked with global markets and was part of the India fund management team and was involved in several VC funding transactions. His experience there included researching prospects for venture capital investing, market research and helping companies develop their strategy and business plans for India. At Swansoft, he worked in investment banking and business development.